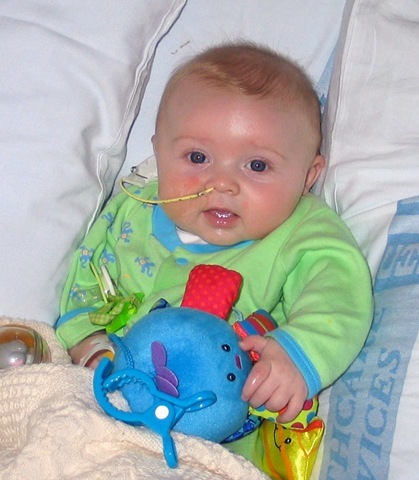 At the age of 4.5 months (May 19, 2005) Jack was “failing to thrive,” not gaining weight on his curve and eating so little we were concerned about his hydration levels so we inserted an NG (Nasogastric) tube. Feedings had become such a fight with him. He would take 2-3 oz, screaming and crying most of the time. We chose it do the tube to take the pressure off of him and me and buy us time to have him “forget” his pain and start on solids. The NG tube goes up his nose and into his stomach. We pumped his formula through the tube directly into his stomach. This tube is easy for him to catch and pull out, so we had to spend the night at Children’s Hospital learning how to replace it. There is no way to describe what it is like to shove a tube up your screaming child’s nose, trying to make sure it doesn’t go into his mouth or lungs, doesn’t go to far into his stomach and get it all securely taped. Unfortunately we found that the tubes tended to wear out after about 10 – 14 days of use, causing them to come open and leak the entire contents of his stomach everywhere. That meant we had to replace the tube at least every 2 weeks. During the first month of Jack having the NG tube, we worked with Robin Glass at Children’s Hospital OTPT (Occupational and Physical Therapy) to get him eating solids. It was our hope that we could just move him onto solids and a sippy cup, forgetting the bottle completely. Unfortunately he got the flu and started vomiting. That brought back all of his pain memories and he stopped taking solid foods soon after that. We tried a couple more times over the next 6 months, only to have him shut down again. 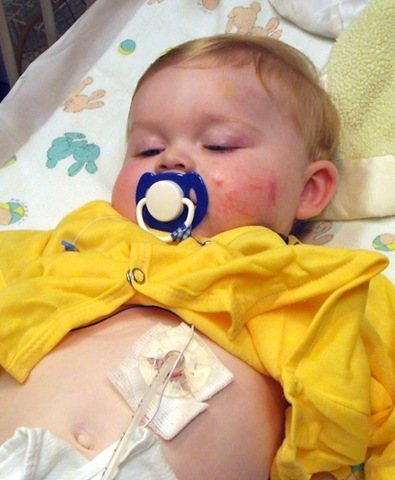 After about 2 months of having his NG tube, Jack started to vomit at least once a day, most of the time more than once. We assumed that the tube was irritating his throat and causing his very sensitive gag reflex to kick in. We saw a ENT specialist to determine if the tube was causing any irritation to his nasal passages. They saw minor irritation, nothing to be alarmed about, but something to be aware of. 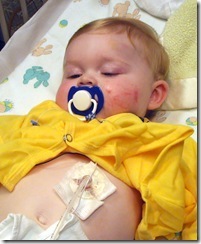 By the time he was 10.5 months old we realized we were in this for the long haul with tube feeding. He wasn’t making progress eating and the tube was becoming a burden to us. He was an active baby crawling, learning to walk and playing with his peers. 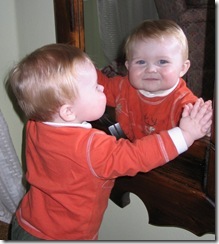 I lived in constant fear that he or one of the other babies would grab at his tube and pull it out. We also got tired of the looks we would get as we walked into stores, people staring at our beautiful little boy not because he was cute, but because he had a tube in his nose. We wanted him to be like any other kid and not defined in anyone’s eyes by the tube in his nose; not a child that always had to be at no more than an arms length away especially around other children. The tape on his nose was a magnet for little fingers. Jack came through the surgery like a champ. We had to spend one night in the hospital, that way they could make sure there wasn’t any bleeding from the surgery and he was tolerating his feedings through the new tube. He wanted to get done and crawl at the hospital and as soon as we were home he took off again like nothing had happened. The tube they inserted initially was a temporary one in place for 3 months, a PEG-tube. It had a disk the size of a quarter in his stomach and a longer tube (~6 inches long) outside of his stomach. It was designed to help the hole through to the stomach heal, as well move the stomach closer to the abdominal wall. After 3 months an endoscopy was performed to remove this tube and replace it with one that was changeable from the outside. This G-tube I changed every 3 months. It was much easier and less traumatic for Jack than the NG tube, but took some getting used to for me. 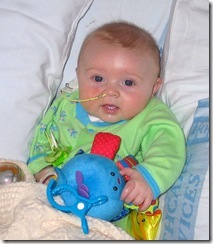 As Jack grew we knew at some point we were going to work on weaning him off of his feeding tube. Up until now he had only really had formula for his stomach and intestines to digest (I am discounting the very small amount of solids he took when he was a baby.) We wanted to get his GI tract used to digesting other foods that way when it came time for him to start eating he hopefully wouldn’t experience stomach discomfort. We met with Melissa Mortensen a Nutritionist at Seattle Children’s. Her specialty was blenderized diets. Together she and I worked out a diet for Jack that would meet his nutrition and introduce his system to other kinds of foods. We agreed that I would make enough blendarized food to cover 2 feedings a day. 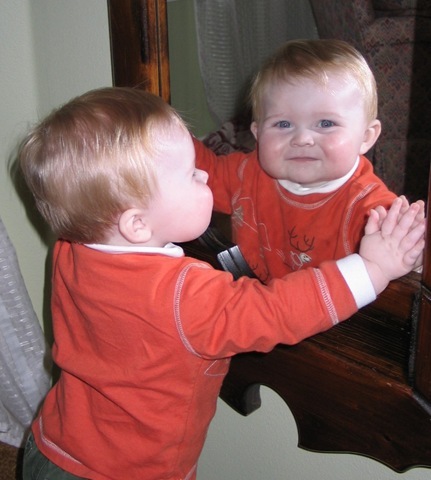 This is the way we tested him to see if his soy and milk intolerances were gone. I would mix a fruit, veggie, meat, grain (usually baby cereal) and milk (soy, then cows milk). It didn’t look or smell very good, but we did this until we started his feeding program, aka Fun With Food. From 11.5 months to 2.5 years old, we just let Jack be when it came to eating. We would put him in his highchair with us at the table and give him cheerios, cheese, goldfish, apples and water to drink, because those were the foods he would accept and try. We were unsure of how to get him to increase is oral feedings to eventually wean off of his feeding tube. Through Robin Glass at Seattle Children’s OTPT we were introduced to Karen Quinn-Shea another Occupational Therapist at Seattle Children’s. She ran a 2 week intensive feeding program to jump start the move to oral feedings. For more info on our program, click here.